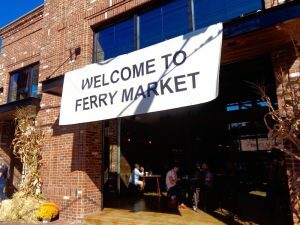 Folks around town were stopping by the new Ferry Market at 32 S. Main St. in New Hope Wednesday to take a gander at its soaring, open architecture and peruse the first wave of food vendors to open. 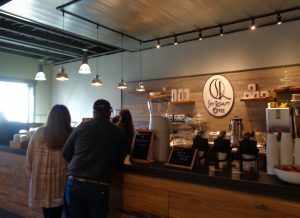 Certainly, much will be written going forward about the array of offerings there, although it’s clear to see that the place is something new and different for New Hope, distinctly modern and sophisticated — an airy, upscaled take on the food court, perhaps. A Poke Bowl from Boku at Ferry Market in New Hope. 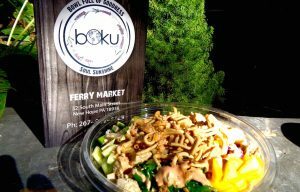 But if you’re waiting for the newness to fade and stalls to fill up, don’t delay a visit to Boku, a Hawaiian food joint (of all things) that miraculously bridges the gap between healthy and delicious. Their main shtick is the Poke (poh-KAY) bowl, a take on the Asian-derived Hawaiian favorite, usually with chunks of marinated meat and seafood. Our Hei Hei Hawiaiian bowl featured grilled chicken, edamame, cabbage, and onions marinated in Boku Teriyaki sauce and served over rice with furikake seasoning, topped with chopped mangoes, cucumber, green peppers, carrots, and chow mein noodles, and drizzled with Yum Yum sauce. It was a home run. The vegetables were fresh and crisp, the chicken savory and spicy, and the sauce added enough zip to keep it all interesting and harmonious. The bowl was $10.99, big enough for two, and available as a wrap. Next on our must-try list at Boku will undoubtedly be the Tamatoa bowl, similar to the Hei Hei Hawaiian, but made with grilled shrimp. You can also build your own Poke bowl or wrap, including breakfast bowls. Oh Berry is a house favorite breakfast bowl featuring fresh vanilla Greek yogurt topped with strawberries, blueberries, banana, organic granola, honey, coconut shavings and Nutella. 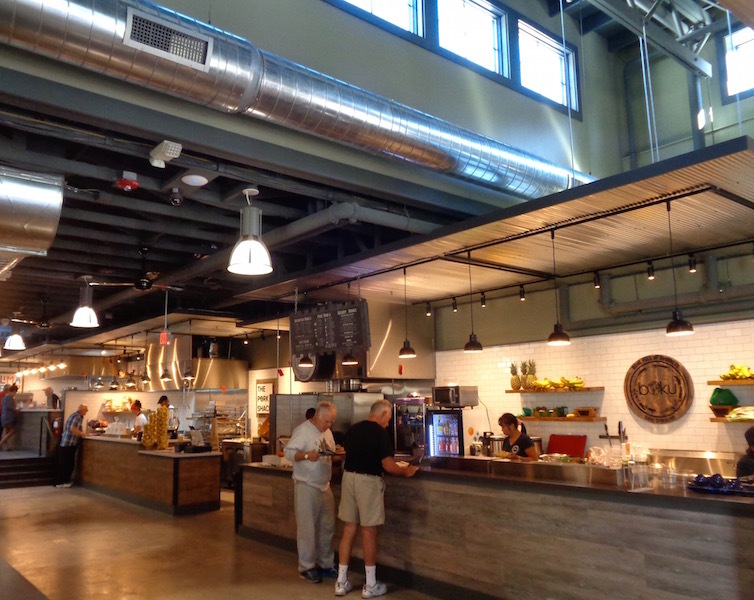 Lots of other stuff to taste at Ferry Market. A Food Court, that’s what the Ferry Market is.